This short domain is a coiled coil structure and has a single cysteine residue at the start which is likely to form a di-sulfide bridge with a corresponding cysteine in an upstream EGF (SM00181) domain thereby spanning a VWA (SM00327) domain. All three domains can be associated together as in the cartilage matrix protein matrilin, where this domain is likely to be responsible for oligomerisation PMID:9287130. This entry represents a short domain found the matrilin (cartilage matrix) proteins. 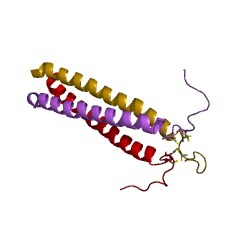 It forms a coiled coil structure and contains a single cysteine residue at its start which is likely to form a di-sulphide bridge with a corresponding cysteine in an upstream EGF domain, thereby spanning the VWA domain of the protein (IPR002035).This domain is likely to be responsible for protein trimerisation [(PUBMED:9287130), (PUBMED:9260286)]. There are 1789 Matrilin_ccoil domains in 1789 proteins in SMART's nrdb database. Taxonomic distribution of proteins containing Matrilin_ccoil domain. This tree includes only several representative species. The complete taxonomic breakdown of all proteins with Matrilin_ccoil domain is also avaliable. Click on the protein counts, or double click on taxonomic names to display all proteins containing Matrilin_ccoil domain in the selected taxonomic class. Primary structure of matrilin-3, a new member of a family of extracellular matrixproteins related to cartilage matrix protein (matrilin-1) and von Willebrandfactor. A mouse cDNA encoding for matrilin-3, the third member of the novel matrilinfamily of extracellular matrix proteins, was cloned. The protein precursor of 481amino acids consists of a putative signal peptide, a short positively chargedsequence, a single vWFA-like domain followed by four epidermal growth factor-likemodules and a potential coiled-coil alpha-helical oligomerization domain at theC-terminus. It is the smallest member of the matrilin family with a predicted Mr of the mature protein of 48 902. The primary structure of a C-terminal portion of310 amino acids of the human matrilin-3 was determined and showed a sequenceidentity to the mouse matrilin-3 of 84.8%. Northern blot hybridization of mousematrilin-3 mRNA showed a 2.9 kb mRNA expressed in sternum, femur and trachea and indicates a cartilage-specific expression. Heteronuclear NMR assignments and secondary structure of the coiled coiltrimerization domain from cartilage matrix protein in oxidized and reduced forms. The C-terminal oligomerization domain of chicken cartilage matrix protein is atrimeric coiled coil comprised of three identical 43-residue chains. NMR spectra of the protein show equivalent magnetic environments for each monomer, indicatinga parallel coiled coil structure with complete threefold symmetry.Sequence-specific assignments for 1H-, 15N-, and 13C-NMR resonances have beenobtained from 2D 1H NOESY and TOCSY spectra, and from 3D HNCA, 15N NOESY-HSQC,and HCCH-TOCSY spectra. A stretch of alpha-helix encompassing five heptad repeats(35 residues) has been identified from intra-chain HN-HN and HN-H alpha NOEconnectivities. 3JHNH alpha coupling constants, and chemical shift indices. Thealpha-helix begins immediately downstream of inter-chain disulfide bonds between residues Cys 5 and Cys 7, and extends to near the C-terminus of the molecule. Thethreefold symmetry of the molecule is maintained when the inter-chain disulfidebonds that flank the N-terminus of the coiled coil are reduced. Residues Ile 21through Glu 36 show conserved chemical shifts and NOE connectivities, as well as strong protection from solvent exchange in the oxidized and reduced forms of the protein. By contrast, residues Ile 10 through Val 17 show pronounced chemicalshift differences between the oxidized and reduced protein. Strong chemicalexchange NOEs between HN resonances and water indicate solvent exchange on timescales faster than 10 s, and suggests a dynamic fraying of the N-terminus of the coiled coil upon reduction of the disulfide bonds. Possible roles for thedisulfide crosslinks of the oligomerization domain in the function of cartilagematrix protein are proposed.